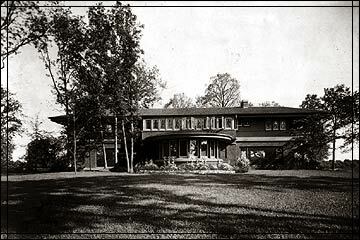 In 1913, Purcell and Elmslie built a summer residence for Edward W. Decker, a Minneapolis banker, on a wooded lot on Lake Minnetonka. Much of the lower level had an open plan, because the Deckers wanted a large area suitable for dancing. In a functional nod to the past, Purcell and Elmslie paved the floors with ceramic tile from the 1870s that they had found in a Minneapolis warehouse and that Purcell described as having "good organic patterns and beautiful flat eggshell surface." The second floor, with seven bedrooms and three baths, was well suited for lots of company. In retrospect, Purcell expressed surprise that a man in Decker's business and of his social standing would employ their firm to develop his country estate; often such prominent figures wanted a conservative Tudor manor or a Mediterranean palazzo. Nonetheless, the architects were pleased to receive the commission. "It was our first opportunity in Minneapolis to do a distinguished and extensive layout," Purcell later wrote, "and Mr. Decker spent all the money that was necessary to make our architectural theses complete in all its detail." The Deckers generally approved the firm's recommendations, prompting Purcell to call the result "really an integral work in every department."